John Le Carre’s classic novel The Spy Who Came in from the Cold. CHOOSE one favourite book? That’s too difficult. I’ve lost count of my favourites across the years. I can however, share a book that changed my reading habits and influenced my writing, took me into another world, a book that 35 years later is dog-eared and tatty from re-reading. The Spy Who Came in from the Cold was riveting the first time and it still captivates me. Thanks to Alec Leamas and his mates in MI5’s Circus I discovered spy stories and dark endings. I devoured John le Carre’s novels, moved on to Frederick Forsyth’s, and detoured to Ian Fleming’s James Bond, although in the case of the Bond stories I wished the women had done more than simper and sashay. This was the 1970s and women were capable of anything! Then along came The New Avengers TV show with Steed and Purdey. Joanna Lumley and her kick-arse character was the ultimate heroine. Here was a woman who was at least as smart as the men, and with an inimitable style. I suspect I drove my family nuts perfecting a pirouetting high kick. Luckily I didn’t do any damage. Yet all this action and intrigue failed to sidetrack me from my first love of the classic love stories such as Pride and Prejudice and Wuthering Heights. When I finally put fingers to the keyboard, I started writing romance, even though bubbling away in the back of my mind was the idea that women had a place in the world of suspense and intrigue. I knew they could be the stars and not just the love interest. They could save the world, save the child, capture the bad guys and take charge without a man telling them what to do. My women wouldn’t expect a man to lay down his life for them – especially not as Alec does in le Carre’s story. They’d be dragging their man to safety over the barbed wire rather than passively accepting their fate. I just had to figure out what sort of story that would be. About this time I re-read The Spy Who Came in from the Cold and realised it wasn’t only the twisting and turning plot that hooked me. Le Carre had taken us into his world, his ordinary world, and it was extraordinary to me because I’d never experienced it. His stories were true to real life while still being fiction. My ordinary world, the flight deck of a Dash 8 aircraft, was the perfect starting point for a series about border protection. I took a deep breath and started writing, using the news of the day as a canvas for my characters, and the Border Watch series was born. Romantic suspense may be a long way from le Carre’s spies, but without that epiphany my feisty heroines wouldn’t be tracking outlawed motorcycle gangs or arsonists, defeating terrorists or stopping drug dealers, all the while finding love. Life would be easier for them, and me, but nowhere near as interesting. Helene Young’s latest novel is Burning Lies (Penguin), the final instalment in her Border Watch trilogy. Blog, Media Australian Romantic Suspense, Border Watch, Burning Lies, Culture, Hachette Australia, Helene Young, My favourite book, Penguin Australia, Shattered Sky, The Weekend Australian, Wings of Fear, Writing. permalink. Ooh, interesting about the Stella Remingtons. I’ve been tempted to try one but never convinced myself to give her a go. I must admit that, like my favourite crime novels, I do love them down and dirty. Have you tried Tom Rob Smith’s Russian-set trilogy, Child 44, The Secret Speech and Agent 6? Gobsmacking reads. Don’t bother looking up his website though. It’s a Flash-ridden shocker and not up to date either. Very annoying. I read a few Le Carres when I was younger then stopped for some reason. I think my head was turned by Robert Ludlum whose stories I had a serious crush on. Couldn’t get enough of that thriller excitement. But I did buy Le Carre’s “A Most Wanted Man” when it came out and loved it. Amazing, if somewhat terrifying in its subject matter! Shelleyrae, I still prefer his earlier books. They linger for days after I’ve finished them. I hoped Stellar Remingtons books would be as good but they are very different an lacking the darkness of Le Carre. Still a good read though! Am midway through Kathryn Fox’s Cold Grave and enjoying all the details. I’m hearing good things about the QF 32 book as well?? 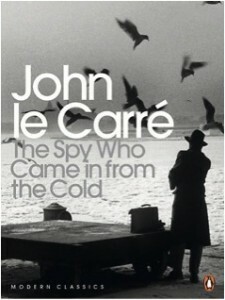 I think I have only read The Spy Who Came In from the Cold by Le Carre, maybe it is time I tried something else by him! I can’t choose one favorite, I have too many. Just finished SHADOW OF FREEDOM, By David Weber, and QF 32, currently reading Ya MARK OF ATHENA!